Whether you're in need of tents and outdoor furniture for a family picnic or linens and china for a sweet 16, our list of kids party rentals in NY can help you plan a flawless event. You can also find moonwalks, bounce houses, carnival games and inflatables that make excellent additions for outdoor children’s parties. Our friends at KidsParties.Party have also put together a comprehensive guide to the best party rental services in NY, as well as companies that specialize in inflatable rentals. 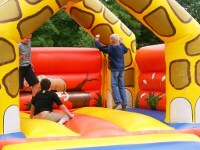 If you're looking for bounce house rentals NY look no further! FunNewYork.com gives you a list of some of the great inflatable rentals NY has to offer. Bounce house rentals in New York can make a party much more fun for kids. 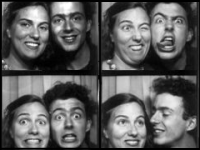 A picture's worth a thousand words, so give your guests the opportunity to take fun and silly pictures in one of these high quality NY photo booths! They will have a blast taking pictures, and they will have a great picture party favor for the memory books.